Door Hardware: Locks, Ironmongery, Lock Products, Fire Escape Doors, Panic Hardware, Gate Locks and lots more. We offer the brands of more than 100 manufacturers, and our Loxperts have more than 125 year’s experience in security and door hardware. 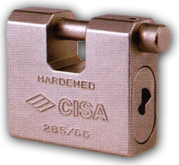 Gate Locks: See our Security Gates page for heavy duty GATE LOCKS.